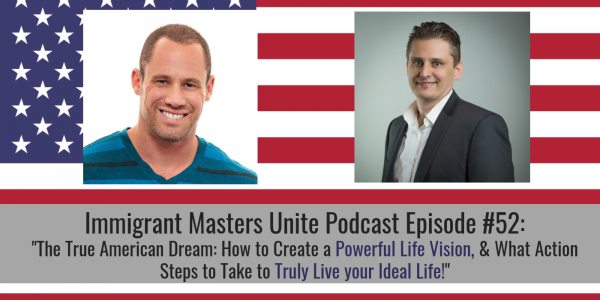 IMU 052: The True American Dream: How to Create a Powerful Life Vision, & What Action Steps to Take to Truly Live your Ideal Life! | Immigrant Masters Unite Podcast: Transform Your Business, Life and The World Around You! Do you feel like you’re doing all the right things, yet something is still missing from your life? This is Polish Peter and welcome to episode 52 of Immigrant Masters Unite. Today, I have Jason Wojciechowski–or Jason “Wojo”– who is the CEO of a coaching company called Lifeonaire. Many business owners have a business vision but not a life vision, and Jason is an expert on what action steps to take to create and live out a life vision. He is actively living the lifestyle that he describes in this episode, one that is in line with the True American Dream rather than the Distorted American Dream. You see, Jason is an employee turned unlikely entrepreneur. Back in 2009, on the surface he looked successful – he had a Ph.D. from Duke, a well-paying, secure job, a new home in a gated community, and all the trappings associated with “living the American dream”. But inside he felt that something was wrong. There had to be more to life than this, he thought. He was in debt, stressed, unfulfilled, overworked, and desperate to live on his own terms. His passion and zeal for the Lifeonaire message led to him becoming a coach, speaker, and in an ironic twist of fate (he previously had sworn off ever having a “real job” again), Jason took on the role of CEO of Lifeonaire in an effort to lead the company in its mission of revealing abundant living to a dying culture. What the “Distorted American Dream” is and how to know if you’re living it. This is one of the biggest lessons I’ve learned early in that has allowed me to set my life up the right now and I hope this message can impact you as well. How to get out of the “hamster wheel” of the 9 to 5 job. Jason outlines the steps that you can use to start getting out of the 9 to 5 today. It’s not an easy process but a simple one. Listen and take action. New ways to define success and how you can use it in your own life. Listen, I believe there are many different ways to define success, outside of finances and once you apply that, your view of yourself will help you grow and be even more successful. What a life vision is and how to discover yours. More importantly, we talked about specific things you need to do to write your Life vision. This is one of the most important documents you absolutely have to have in your life. If there’s one thing that you should take away from this call, is that you need to have vision for your life. Listen carefully and start writing your own vision today. Lifeonaire Events – SPECIAL IMU PRICING OFFER: After the interview, I spoke to Jason to offer my listeners a special pricing and he agreed. Therefore, once you land on the site and pick the event location you would like to attend, make sure to add the following coupon code to the “promo code” area during the checkout to get a 50% discount off the current price. How cool is that?